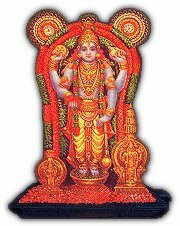 Nata Thurakkal (Opening) is at morning 3 o'clock for the Nirmalyadarshan to the melodious strains of the Nadaswaram and the devoted chanting of 'Narayana, Narayana' in his especially auspicious Dersan. The lord is still adorned with the flowers and garland of previous day. The is then rituly bathed and dressed to represent Balagopala or Krishna as a child. The importent Ucha Pooja takes place at midday. During the Diparadhana the eleboratly bedeked idol glows in the warm lamps of the temple lamps. Utsavam (festival) is for 10 days in February or March with elephant race, Processions and several rituals. Astami Rohini is around August or September and Vishukani Festival in April. A devotee can enter the Temple through the eastern gopura, or western gopura. It is ideal that the darshan is made after a dip in the Temple pond (Rudratheertha) and in wet clothes. While making the darshan one has to be careful not to violate the Temple rules. Doubts can be cleared by consulting the attendants and security officers inside the Temple. Devotees are not allowed to enter the Temple, wearing shirt, baniyan, pants, pyjama, lungi, printed dhoti, chudidar, chappals etc. These can be kept at the, Devaswom cloak rooms free of cost. There are facilities for the, same at the east nada and west nada. Camera, Video Camera, Tape recorder, radio etc should not be taken into the Chuttambalam. The devotees are not allowed to stand on the big 'balikallu` inside the Temple, for the darshan. 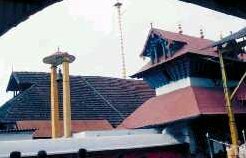 The newly married couples are not allowed inside the nalambalam, soon after the marriage ceremony. Devotees should be careful not to spit or vomit inside the Temple. Those found dirtying the Temple will have to pay for the 'Punyaha' (purification ceremony). So, small children should not be allowed inside the 'nalambalam' for a long time.